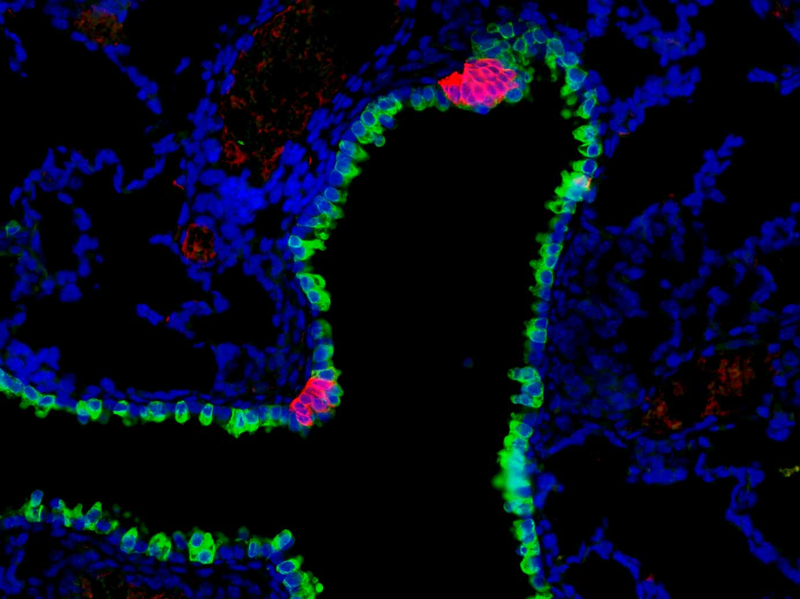 A mouse airway outlined by an epithelial marker for club cells (green), annotated by clusters of pulmonary neuroendocrine cells (magenta) which perform sensory function. At resting, an average person inhales/exhales 5-8 litters of air. This air may vary in oxygen content, carry allergen, pollutants or pathogens. Each of these signals would trigger a specific set of responses. For example, allergen causes asthma while intermittent hypoxia causes pulmonary hypertension. How the specificity is established is poorly understood. We recently found that pulmonary neuroendocrine cells, which represents less than 1% of cells in the lung, function as sensors on the airway wall (Branchfield et al., Science, 2016). These cells are the only innervated epithelial cells in lung, and act through secreting potent neuropeptides, neurotransmitters and amines. We found that overactivation of these cells leads to heightened baseline immune responses. We will test the hypothesis these cells serve as key nodes that mediate lung, immune and nervous system interactions. Alveologenesis is the final step of lung maturation, which subdivides the alveolar region of the lung into smaller units called alveoli. Each of the nascent dividers serves as a new gas-exchange surface. Disruption of the final steps of lung development including alveologenesis results in alveoli simplification, as is seen in premature infants diagnosed with bronchopulmonary dysplasia (BPD). BPD is often associated with lifelong breathing deficiencies, pulmonary hypertension and accelerated decline in respiratory capacity. To date, a majority of studies of alveologenesis rely on two-dimensional (2D) analysis of tissue sections. Given that an overarching theme of alveologenesis is thinning and extension of the epithelium and mesenchyme to facilitate gas exchange, often only a small portion of a cell or a cellular structure is represented in a single 2D plane. We have used a three-dimensional (3D) approach to examine the structural architecture and cellular composition of myofibroblasts, lipofibroblasts, alveolar type 2 cells and elastin extracellular matrix in normal as well as BPD-like mouse lungs (Branchfield et al., Dev Biol, 2015). The insights revealed by 3D reconstruction of the septae set the foundation for future investigations of the mechanisms driving alveologenesis, as well as causes of alveolar simplification in BPD. We have also used a genetic approach to investigate the role of signaling pathways such as FGF (Herriges et al, Developmental Cell, 2015). Ongoing work in this direction interrogates how different elements of prematurity impacts long-term lung function. We are interested in why some BPD patients develop pulmonary hypertension while others do not, and why BPD patients are more susceptible to viral infections. In the trachea and main bronchi, airway smooth muscle and cartilage are localized to complementary domains surrounding the airway epithelium. Proper juxtaposition of these tissues ensures a balance of elasticity and rigidity that is critical for effective air passage. It was unknown how this tissue complementation is established during development. We carried out a study to dissect the developmental relationship between these tissues by genetically disrupting either smooth muscle formation or cartilage formation and assessing the impact on the remaining lineage (Hines et al., PNAS, 2013). We found that in both the trachea and main bronchi, loss of either smooth muscle or cartilage resulted in an increase in cell number of the remaining lineage, namely the cartilage or smooth muscle, respectively. However, only in the main bronchi, but not in the trachea, did the loss of either smooth muscle or cartilage lead to a circumferential expansion of the remaining lineage. In addition to changes in the smooth muscle, cartilage deficient tracheas displayed epithelial phenotypes, including decreased basal cell number, precocious club cell differentiation, and increased secretoglobin expression. Smooth muscle deficient tracheas also show cartilage segmentation defects. These findings suggest extensive crosstalk among the cartilage, smooth muscle and epithelium to shape the airway. Ongoing work in this direction extends to include the vasculature and the neurons, and consider the airway microenvironment as a whole. We aim to test the possibility that in patients with malformation of either the airway cartilage or smooth muscle at birth, such as in tracheomalasia and cystic fibrosis patients, these developmental structural defects may contribute to the complex airway dysfunction that manifest at a later time. As the acquisition of high-resolution patient genomic data becomes routine, we seek to capture this opportunity and use advanced technology such as CRISPR/Cas9 genome editing to interrogate causal relationships between patient-specific genetic variants and phenotypes and disease mechanisms. Towards this goal, we started with congenital disorders as they are caused by single or small numbers of mutations with large effects. In the past few years, we have studied a number of lung-related congenital disorders, including tracheo-esophageal fistula (Domyan et al., Development 2011), tracheobronchomalacia (Hines et al., PNAS 2013), and congenital diaphragmatic hernia (CDH) (Domyan et al., Dev Cell, 2013; Branchfield et al., Science, 2016, McCulley et al., in prep). Using CDH as an example, we have been collaborating with human geneticists to test the functional significance of the genomic variants found in their trio (patient and parents) whole exome or genome sequencing efforts. We have established a pipeline to first determine candidate gene expression in the developing lung (Herriges et al., Dev Dynamics, 2012), and then use CRISPR/Cas9 tools to recapitulate the mutations in mice, and determine which variants may be causal to the phenotypes. Thus far, we have uncovered different mechanisms from distinct genetic models of CDH, suggesting that the identification of the genetic lesions in human CDH may inform personalized treatments. Furthermore, the studies of disease models also led to exciting basic biology discoveries (Domyan et al., Dev Cell, 2013; Branchfield et al., Science, 2016, McCulley et al., in prep). We look forward to expanding this line of investigation to more genes and diseases. PBX transcription factors drive pulmonary vascular adaptation to birth. McCulley DJ, Wienhold MD, Hines EA, Hacker TA, Rogers A, Pewowaruk RJ, Zewdu R, Chesler NC, Selleri L, Sun X. JCI, 2017 Dec doi:10.1172/JCI93395 [Epub ahead of print]. FGF receptors control alveolar elastogenesis. Li R, Herriges JC, Chen L, Mecham RP, Sun X. Development, 2017 Dec 144(24):4563-4572. TET-mediated DNA demethylation controls gastrulation by regulating Lefty-Nodal signalling.Dai HQ, Wang BA,Chapman DL, Fuchou Tang FC, Sun X*, Xu GL*. Nature, 2016 Oct 538(7626):528-532. *Co-corresponding authors. E3 ubiquitin ligase RFWD2 controls lung branching through protein-level regulation of ETV transcription factors.Zhang Y, Yokoyama S, Herriges JC, Zhang Z, Verheyden JM, Young RE, Sun X. PNAS. 2016 Jul 113(27):7557-62. Pulmonary neuroendocrine cells function as airway sensors to control lung immune response.Branchfield K, Nantie L, Verheyden JM, Sui P, Wienhold MD, Sun X. Science. 2016 Feb, 351:707-10. Perspective of this study was published in Science here. A three-dimensional study of alveologenesis in mouse lung Branchfield K, Li R, Lungova V, Verheyden JM, McCulley D, Sun X. Dev Biol. 2016 Jan 409:429-41. DB Outstanding paper award 2016. FGF-Regulated ETV Transcription Factors Control FGF-SHH Feedback Loop in Lung Branching Herriges JC, Verheyden JM, Zhang Z, Sui P, Zhang Y, Anderson MJ, Swing DA, Zhang Y, Lewandoski M, Sun X. Dev Cell. 2015 Nov 9;35(3):322-32. Ontogeny of the mouse vocal fold epithelium Lungova V., Leydon C., J. Verheyden, Sun X*. and Thibeault S*. Dev Biol. 2015 Mar 399(2): 263-282. *co-corresponding authors. Cover image. Establishment of smooth muscle and cartilage juxtaposition in the developing mouse upper airways Hines, E., Jones, M., Verheyden, J., Harvey, J. and Sun, X. PNAS. 2013 Nov 110(48):19444-9. Roundabout receptors are critical for foregut separation from the body wall Domyan, E.T., Branchfield, K., Gibson, G.A., Naiche, L.A., Lewandoski, M., Tessier-Lavigne, M., Ma, L. and Sun, X. Dev Cell, 2013 Jan 24(1):52-63. Selected as featured article of the issue. Genome-scale study of transcription factor expression in the branching mouse lung Herriges J.C., Yi L., Hines E.A., Harvey J.F., Xu G., Gray P.A., Ma Q., Sun X. Dev Dyn 2012 Sep 241(9):1432-1453. The microRNA-processing enzyme Dicer is dispensable for somite segmentation but essential for limb bud positioning Zhang Z, O'Rourke JR, McManus MT, Lewandoski M, Harfe BD and Sun X. Dev Dyn. 2011 Mar 351(2), 254-265. Signaling through BMP receptors promotes respiratory identity in the foregut via repression of Sox2 Domyan, E.T., Ferretti, E.,ockmorton, K., Mishina, Y., Nicolis, S.K. and Sun, X. Development 2011 Mar 138(5): 971-981. Preaxial polydactyly: interactions among ETV, TWIST1 and HAND2 control anterior-posterior patterning of the limb Zhang, Z., Sui, P., Dong, A., Hassell, J., Cserjesi, P., Chen, Y.T., Behringer, R.R. and Sun, X. Development 2010 Oct 137(20), 3417-3426. Beta-Catenin promotes respiratory progenitor identity in mouse foregut Harris-Johnson, K.S., Domyan, E.T., Vezina, C.M. and Sun, X. PNAS 2009 Sep 106(38), 16287-92. FGF-regulated Etv genes are essential for repressing Shh expression in mouse limb buds Zhang, Z., Verheyden, J.M. and Sun, X. Dev Cell 2009 Apr 16(4): 607-613. An Fgf/Gremlin inhibitory feedback loop triggers termination of limb bud outgrowthVerheyden, J.M. and Sun, X. Nature 2008 Jul 454(7204): 638-641. Dicer function is essential for lung epithelium morphogenesis Harris, K.S., Zhang, Z., McManus, M.T., Harfe, B.D. and Sun, X. PNAS 2006 Feb 103 (7), 2208-2213. Xin Sun received her Ph.D. from the Department of Biology at Yale University and postdoctoral training with Dr. Gail Martin at UCSF. She was on the faculty in the Genetics Department at University of Wisconsin-Madison from 2002 to 2016, when she joined the UCSD faculty. Dr. Sun was the recipient of a Burroughs-Wellcome career award, a March of Dimes Basil O’Conner award, and Romnes Faculty Fellowship by Wisconsin Alumni Research Foundation.